The Following are the Services offered by the Society. Daily Activities and special programs held within college are announced through the PA system while special announcements regarding activities of clubs, societies and sports related activities are announced by the Announcers’ pool of MURC every single day. 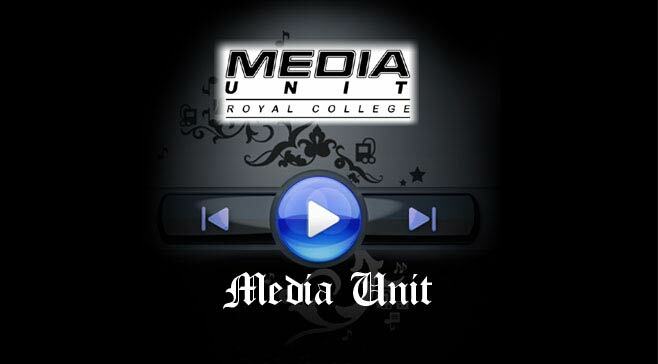 A Daily news bulletin is uploaded to the Facebook group” Royal College News”. We hope to enhance this service to ‘SMS’ updates and weekly newsletter. 6 News boards are being maintained by the Unit, where the latest sports achievements, events organized by other clubs of Royal College, and special announcements regarding the college are put up. Training sessions are being conducted for young announcers by senior announcers who have broad experience in announcing. These discussions are focused on aspects of visual communications and how visual communication affects human relations and society. Most of the articles for KIRULA – the official magazine of MURC- were written based on these discussions. A renowned announcer visits Royal College every two weeks for a special workshop. This programme is conducted on Thursdays. Members of MURC represents Royal College at many TV and Radio programmes. have been able to show their talents in these programmes. Following students are representing Royal College at various TV and Radio programmes. ‘Kirula’ is a trilingual sole publication of the Media Unit of Royal College. Since it was launched in year 2004, it has contributed immensely in strengthening the standards, reputation and good will of the Alma mater while providing entertainment for the readers. Kirula is a magazine published focused especially on students. Throughout the years it has taken marvellous efforts to guide students in the correct path and achieve great heights in their studies. Kirula has established its stature as a source of entertainment and as a source of information for students to attain both academic and spiritual development. Series of comics, cartoons etc. exclusively presented in Kirula, act as a major source of entertainment. The first issue of the Magazine is scheduled to be released by the 2nd week of October and so far it is under proof checking of to which a Special Committee has been appointed by the Unit, which would ensure the release of the Magazine would not be delayed. The Poster & Graphic team is one of the main methods of Communicating & Promoting School events among students. One of the main services are the Posters set up to Promote the Big Match, Bradby Shield etc.